Download "KENYA Ending the cycle of impunity"
1 KENYA Ending the cycle of impunity Impunity continues to be the principal cause of the perpetuation and encouragement of human rights violations and, in particular, torture. United Nations Special Rapporteur on torture, October Introduction Amnesty International is concerned that torture is still being committed by the Kenyan police force and that it continues because of the lack of effective action taken by the government to stamp it out. 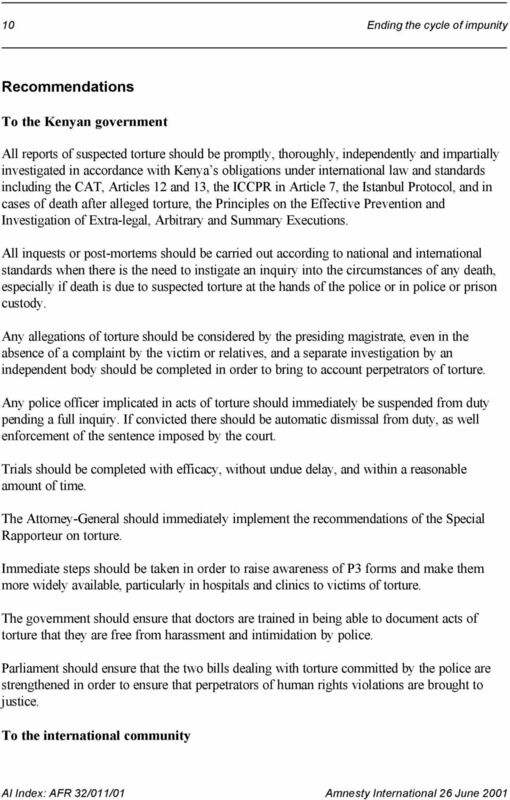 This report is being issued by Amnesty International as the 26 June 2001 is the UN Day for Victims of Torture, and it is four year since the Convention against Torture and Other Cruel, Inhuman or Degrading Treatment or Punishment (CAT) was ratified by Kenya. Amnesty International continues to share the concerns expressed by the United Nations (UN) Special Rapporteur on torture following his visit to Kenya in September Justice in Kenya is arbitrary when dealing with cases of torture by police. The lack of effective action by the government is evidence of its acquiescence in the actions of the police and the failure to respect the rule of law. Those who are victims of police brutality usually are the least able to speak out or bring their case to court. Unless the family of a victim of torture speaks out, or there is pressure from human rights groups, investigations and prosecutions are rare. 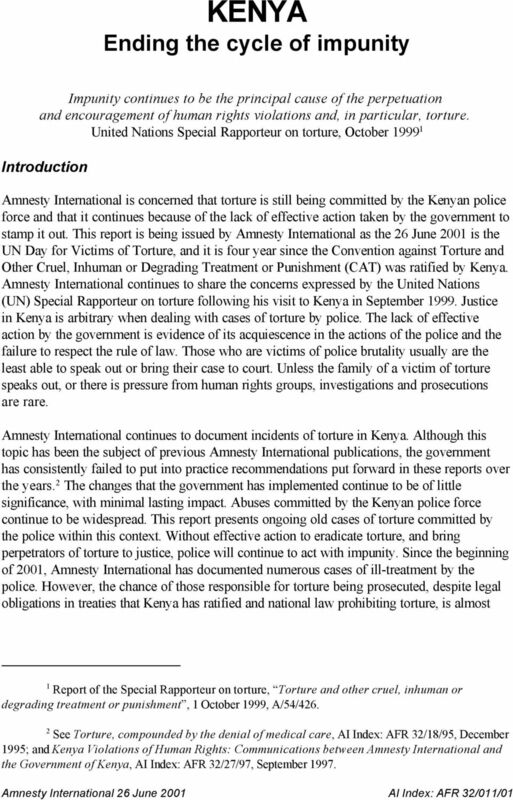 Amnesty International continues to document incidents of torture in Kenya. Although this topic has been the subject of previous Amnesty International publications, the government has consistently failed to put into practice recommendations put forward in these reports over the years. 2 The changes that the government has implemented continue to be of little significance, with minimal lasting impact. Abuses committed by the Kenyan police force continue to be widespread. This report presents ongoing old cases of torture committed by the police within this context. Without effective action to eradicate torture, and bring perpetrators of torture to justice, police will continue to act with impunity. Since the beginning of 2001, Amnesty International has documented numerous cases of ill-treatment by the police. 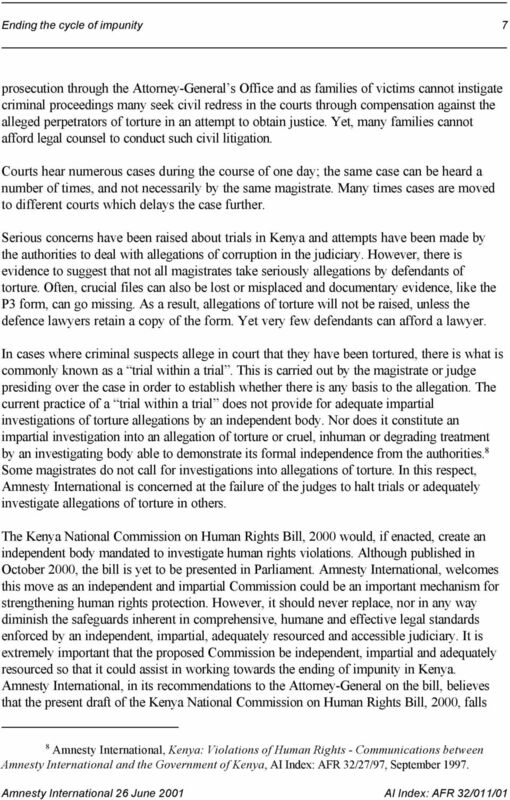 However, the chance of those responsible for torture being prosecuted, despite legal obligations in treaties that Kenya has ratified and national law prohibiting torture, is almost 1 Report of the Special Rapporteur on torture, Torture and other cruel, inhuman or degrading treatment or punishment, 1 October 1999, A/54/ See Torture, compounded by the denial of medical care, AI Index: AFR 32/18/95, December 1995; and Kenya Violations of Human Rights: Communications between Amnesty International and the Government of Kenya, AI Index: AFR 32/27/97, September 1997. 3 Ending the cycle of impunity 3 not widely accessible to victims of torture. Many cases can take years to complete and successful prosecutions resulting in an appropriate sentence are rare. 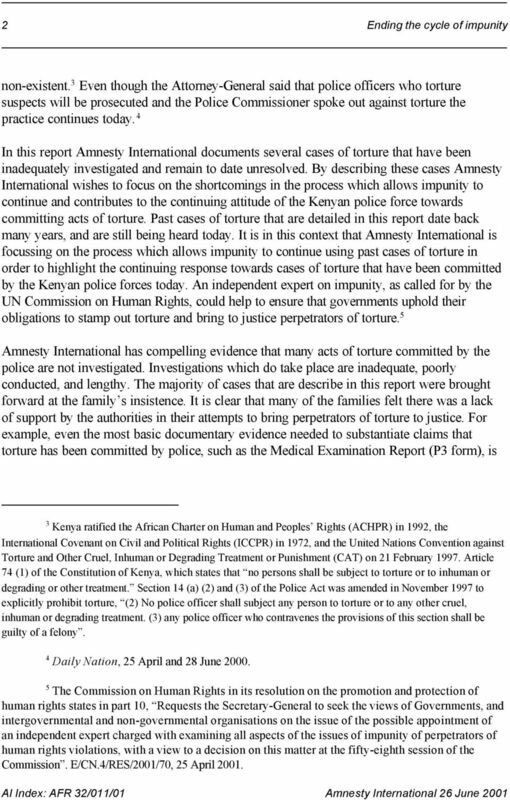 Amnesty International remains concerned that the Kenyan government appears to condone torture: in December 1998 Major Marsden Madoka, Minister of State for Internal Security, urged Kenyans to forget about the widespread acts of torture committed by the country s security forces. 6 As far as Amnesty International is aware there has not been a retraction of the statement despite the government s admission that torture is widespread among Kenya s security forces. 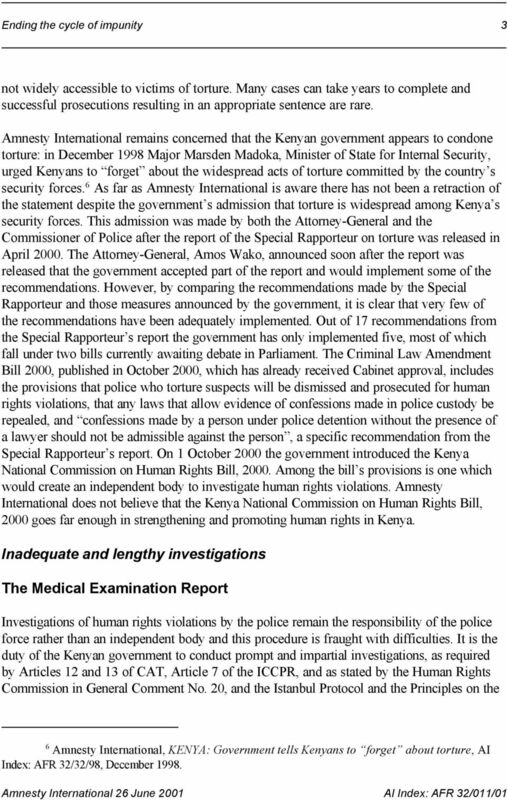 This admission was made by both the Attorney-General and the Commissioner of Police after the report of the Special Rapporteur on torture was released in April The Attorney-General, Amos Wako, announced soon after the report was released that the government accepted part of the report and would implement some of the recommendations. However, by comparing the recommendations made by the Special Rapporteur and those measures announced by the government, it is clear that very few of the recommendations have been adequately implemented. Out of 17 recommendations from the Special Rapporteur s report the government has only implemented five, most of which fall under two bills currently awaiting debate in Parliament. The Criminal Law Amendment Bill 2000, published in October 2000, which has already received Cabinet approval, includes the provisions that police who torture suspects will be dismissed and prosecuted for human rights violations, that any laws that allow evidence of confessions made in police custody be repealed, and confessions made by a person under police detention without the presence of a lawyer should not be admissible against the person, a specific recommendation from the Special Rapporteur s report. On 1 October 2000 the government introduced the Kenya National Commission on Human Rights Bill, Among the bill s provisions is one which would create an independent body to investigate human rights violations. Amnesty International does not believe that the Kenya National Commission on Human Rights Bill, 2000 goes far enough in strengthening and promoting human rights in Kenya. Inadequate and lengthy investigations The Medical Examination Report Investigations of human rights violations by the police remain the responsibility of the police force rather than an independent body and this procedure is fraught with difficulties. It is the duty of the Kenyan government to conduct prompt and impartial investigations, as required by Articles 12 and 13 of CAT, Article 7 of the ICCPR, and as stated by the Human Rights Commission in General Comment No. 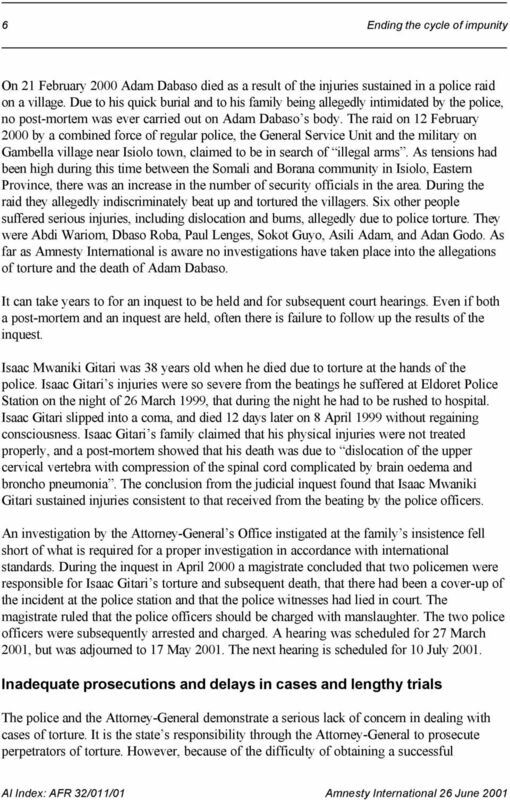 20, and the Istanbul Protocol and the Principles on the 6 Amnesty International, KENYA: Government tells Kenyans to forget about torture, AI Index: AFR 32/32/98, December 1998. 5 Ending the cycle of impunity 5 unable to return to work. On 14 May 1999 Yusuf Anitwani Maina fell into a coma and died. He left a wife, seven children and over 10 other dependents. The post-mortem showed that he had died from a head injury, which was consistent with the injuries he had sustained during the police beating. No investigation has ever been carried out by the police into the beating or as to why Yusuf Maina was denied a P3 form. The law in Kenya provides for instituting an inquest, an inquiry into the circumstances of any death, especially if death is due to suspected torture at the hands of the police or in police or prison custody. As far as Amnesty International is aware an inquest has never been held. Yusuf Anitwani Maina s family instigated civil proceedings for special damages against the Attorney-General and the two police officers attached to Bungoma Police Station on 8 June 2000 at Bungoma High Court. The case has been heard three times so far, on 8 February 2001, 5 April 2001, 18 April 2001 and is due to be heard next on 30 August For each hearing the magistrate has been unavailable and as of the time of writing this report none of the police officers involved has been questioned. 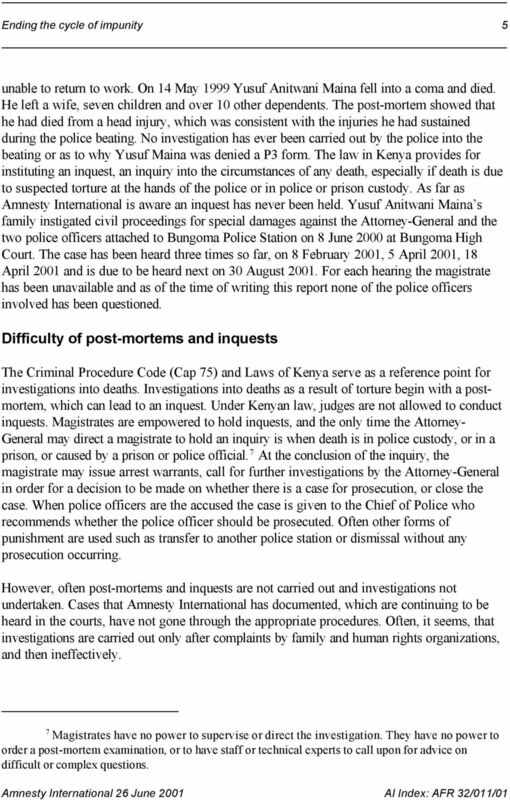 Difficulty of post-mortems and inquests The Criminal Procedure Code (Cap 75) and Laws of Kenya serve as a reference point for investigations into deaths. Investigations into deaths as a result of torture begin with a postmortem, which can lead to an inquest. Under Kenyan law, judges are not allowed to conduct inquests. Magistrates are empowered to hold inquests, and the only time the Attorney- General may direct a magistrate to hold an inquiry is when death is in police custody, or in a prison, or caused by a prison or police official. 7 At the conclusion of the inquiry, the magistrate may issue arrest warrants, call for further investigations by the Attorney-General in order for a decision to be made on whether there is a case for prosecution, or close the case. When police officers are the accused the case is given to the Chief of Police who recommends whether the police officer should be prosecuted. Often other forms of punishment are used such as transfer to another police station or dismissal without any prosecution occurring. However, often post-mortems and inquests are not carried out and investigations not undertaken. Cases that Amnesty International has documented, which are continuing to be heard in the courts, have not gone through the appropriate procedures. Often, it seems, that investigations are carried out only after complaints by family and human rights organizations, and then ineffectively. 7 Magistrates have no power to supervise or direct the investigation. 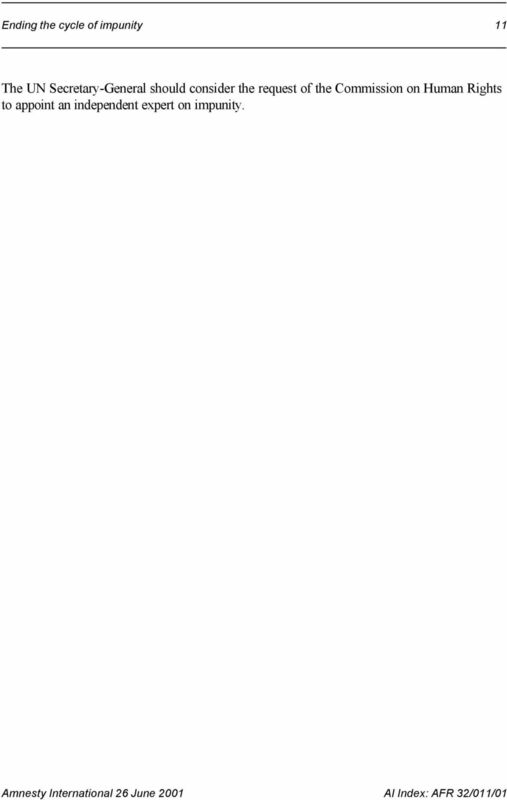 They have no power to order a post-mortem examination, or to have staff or technical experts to call upon for advice on difficult or complex questions. 7 Ending the cycle of impunity 7 prosecution through the Attorney-General s Office and as families of victims cannot instigate criminal proceedings many seek civil redress in the courts through compensation against the alleged perpetrators of torture in an attempt to obtain justice. Yet, many families cannot afford legal counsel to conduct such civil litigation. Courts hear numerous cases during the course of one day; the same case can be heard a number of times, and not necessarily by the same magistrate. Many times cases are moved to different courts which delays the case further. Serious concerns have been raised about trials in Kenya and attempts have been made by the authorities to deal with allegations of corruption in the judiciary. However, there is evidence to suggest that not all magistrates take seriously allegations by defendants of torture. Often, crucial files can also be lost or misplaced and documentary evidence, like the P3 form, can go missing. 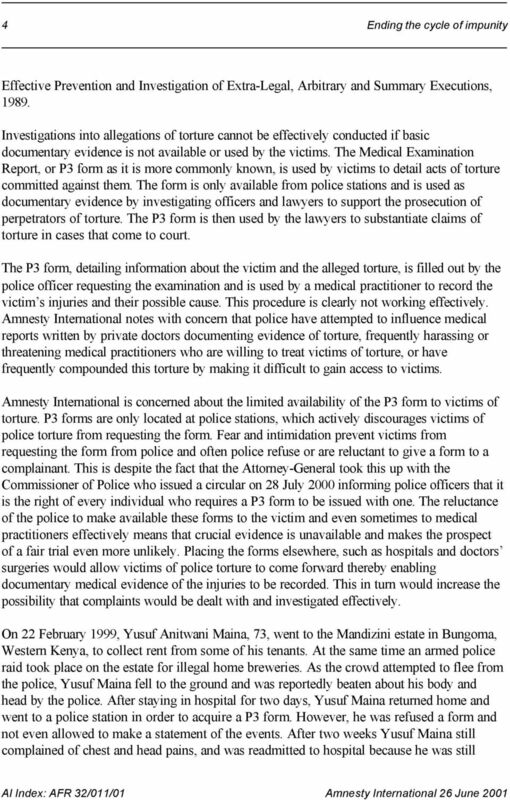 As a result, allegations of torture will not be raised, unless the defence lawyers retain a copy of the form. Yet very few defendants can afford a lawyer. In cases where criminal suspects allege in court that they have been tortured, there is what is commonly known as a trial within a trial. This is carried out by the magistrate or judge presiding over the case in order to establish whether there is any basis to the allegation. The current practice of a trial within a trial does not provide for adequate impartial investigations of torture allegations by an independent body. Nor does it constitute an impartial investigation into an allegation of torture or cruel, inhuman or degrading treatment by an investigating body able to demonstrate its formal independence from the authorities. 8 Some magistrates do not call for investigations into allegations of torture. In this respect, Amnesty International is concerned at the failure of the judges to halt trials or adequately investigate allegations of torture in others. The Kenya National Commission on Human Rights Bill, 2000 would, if enacted, create an independent body mandated to investigate human rights violations. Although published in October 2000, the bill is yet to be presented in Parliament. Amnesty International, welcomes this move as an independent and impartial Commission could be an important mechanism for strengthening human rights protection. However, it should never replace, nor in any way diminish the safeguards inherent in comprehensive, humane and effective legal standards enforced by an independent, impartial, adequately resourced and accessible judiciary. It is extremely important that the proposed Commission be independent, impartial and adequately resourced so that it could assist in working towards the ending of impunity in Kenya. 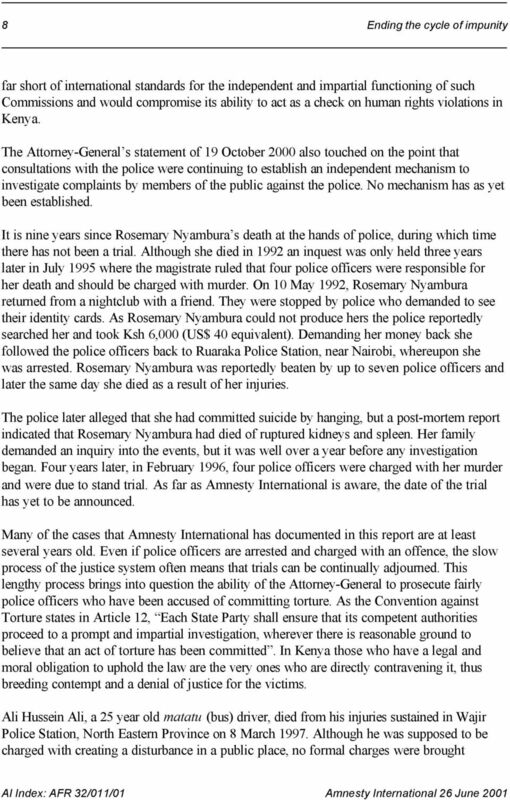 Amnesty International, in its recommendations to the Attorney-General on the bill, believes that the present draft of the Kenya National Commission on Human Rights Bill, 2000, falls 8 Amnesty International, Kenya: Violations of Human Rights - Communications between Amnesty International and the Government of Kenya, AI Index: AFR 32/27/97, September 1997. 9 Ending the cycle of impunity 9 against him. His post- mortem revealed that he had died from internal bleeding in the brain and thoracic cavity due to external trauma. On 24 March 1997 three policemen and an army officer were charged with Ali Hussein Ali s murder but were acquitted in October In 1998 the Principal Magistrate in the inquest of Ali Hussein Ali ruled that the police officers and army officer involved should face justice in a court of law for such an inhuman act done by the suspects herein culminating into the death of the deceased. 9 Almost two years later, the High Court ordered a retrial on 19 July 1999 after Ali Hussein s family appealed, and the three remaining defendants, as one was shot and killed while being rearrested, were to be brought to trial scheduled on 28 February There have been many subsequent delays to the start of the trial. Another of the defendants died while undergoing treatment for typhoid at Kenyatta National Hospital: the trial of the remaining two defendants is continuing. Ali Hussein Ali s family have unsuccessfully petitioned the Attorney-General for an independent prosecutor as they claim that they have lost confidence in the ability of the office of the Attorney- General to prosecute the trial fairly. 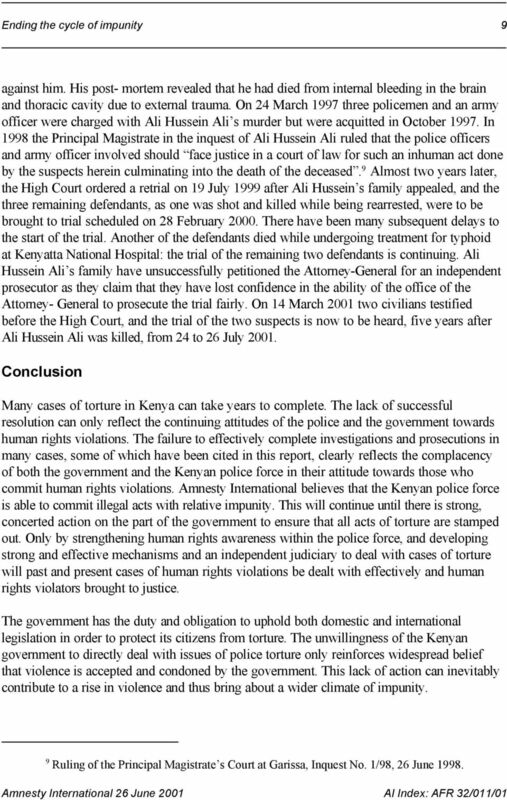 On 14 March 2001 two civilians testified before the High Court, and the trial of the two suspects is now to be heard, five years after Ali Hussein Ali was killed, from 24 to 26 July Conclusion Many cases of torture in Kenya can take years to complete. The lack of successful resolution can only reflect the continuing attitudes of the police and the government towards human rights violations. The failure to effectively complete investigations and prosecutions in many cases, some of which have been cited in this report, clearly reflects the complacency of both the government and the Kenyan police force in their attitude towards those who commit human rights violations. Amnesty International believes that the Kenyan police force is able to commit illegal acts with relative impunity. This will continue until there is strong, concerted action on the part of the government to ensure that all acts of torture are stamped out. Only by strengthening human rights awareness within the police force, and developing strong and effective mechanisms and an independent judiciary to deal with cases of torture will past and present cases of human rights violations be dealt with effectively and human rights violators brought to justice. The government has the duty and obligation to uphold both domestic and international legislation in order to protect its citizens from torture. The unwillingness of the Kenyan government to directly deal with issues of police torture only reinforces widespread belief that violence is accepted and condoned by the government. This lack of action can inevitably contribute to a rise in violence and thus bring about a wider climate of impunity. 9 Ruling of the Principal Magistrate s Court at Garissa, Inquest No. 1/98, 26 June 1998. 11 Ending the cycle of impunity 11 The UN Secretary-General should consider the request of the Commission on Human Rights to appoint an independent expert on impunity.